Dalmatian jasper is a lovely beige colour, dappled with black and tan. 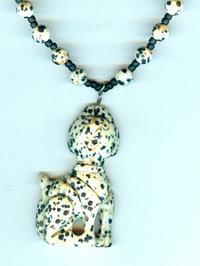 It was inevitable, I suppose, that someone would carve a dalmatian dog from dalmatian jasper. Luckily, the result is as pretty as it is amusing. The pendant measures about 1-1/8 inch at its widest, by 3/8 inch thick, and dangles 2-1/4 inches below the strand. At 28 inches, the strand is a generous length. 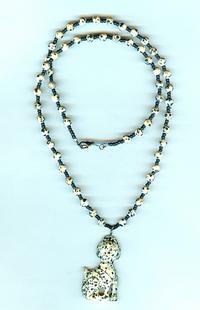 It features 6mm dalmatian jasper round beads and matte black seed beads. It closes with a gunmetal coloured lobsterclaw clasp. What a great gift for the lady who loves dogs! A necklace this clever and affordable could only come from SPARKLE PLENTY. All our one of a kind and limited edition artisan beaded jewelry is individually handcrafted in our studio in Los Angeles, California. Be sure to browse our online store to see all our bracelets, necklaces and earrings and other fashion accessories.